DemoCurmudgeon: Like Putin-Trump-Walker!!! Russian Republicans now hiding NRA Dark Money, have always said "We're not a democracy..."
Like Putin-Trump-Walker!!! Russian Republicans now hiding NRA Dark Money, have always said "We're not a democracy..."
This probably won't mean much to those Trump groveling admirers of dictatorial leaders like Russia's Putin, but for everyone else, GULP!!! I'm assuming they think this is just another "fake news" nothing-burger created by "snowflake" liberals still angry about losing the election since my Trumpian conservative friend in Milwaukee hasn't said jack sh** about it. 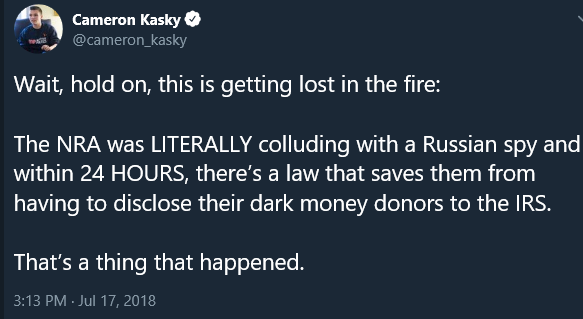 The stench around the Trump Party and supporting big money lobbyists like the NRA found a match with Putin's KGB style of influence peddling and corruption. No surprise there. A Siberian woman charged Monday (with) seeking to infiltrate American political organizations, including the National Rifle Association, on behalf of the Kremlin to interfere with U.S. politics ... was at Gov. Scott Walker’s presidential campaign launch ... A 2015 blog post attributed to her at the time, Mariia Butina said Walker greeted her in Russian and she did not detect any hostility from him toward Russia, according to an April 2018 report from Rolling Stone. Maria Butina is a protégé of Alexander Torshin (left in photo), a powerful Russian banking official and close associate of Russian President Vladimir Putin. According to an online translation of her post in Russian, Butina wrote her "acquaintance with Scott Walker will remain in my memory forever." Photos of their talk were posted on the website of Our American Revival, a political group set up by Walker leading up to his presidential run. Walker spokesman Brian Reisinger said that while Walker was in Tennessee, he "appeared in an atrium area … were thousands of people ... approached the governor and asked to say hello and take a photo with him." Reisinger did not say if Walker discussed his views on Russia with Butina, as she claimed. Flynn: "Walker lies continuously. He's a robot in a sense, he has a flat AFECT, no human emotion displayed. No joy, sorrow, anger, fear, and there's a certain way of handling somebody like that, who frequently says something that's untrue." She founded a Russian gun rights group, Right to Bear Arms, in 2011 and repeatedly claimed on social media that she was a lifetime member of the National Rifle Association. In 2013, her gun rights group got John Bolton, now Trump's national security adviser, to appear in a video that was used in the group's lobbying. Trump Treasury Ends Reporting Contributions to NRA: Wow, that was fast. Where the f**k are the Democrats? Why didn't they sound the alarms??? VOX: The US government is making it easier for “dark money” donors to keep their contributions, well, in the dark. The Treasury Department on Monday said it planned to end requirements that certain tax-exempt organizations identify their financial contributors on their tax returns. The decision means groups such as the National Rifle Association ... will no longer have to tell the IRS who’s giving them money. The decision landed the same day as the Justice Department announced the arrest of Maria Butina, a Russian national with NRA ties who is accused of trying to influence US politics.Ethics experts say Treasury’s maneuver will make identifying activities like those Butina has been accused of even harder to track. Sen. Ron Wyden (D-OR), the ranking member of the Senate Finance Committee, sounded the alarm bells in a statement on Monday. 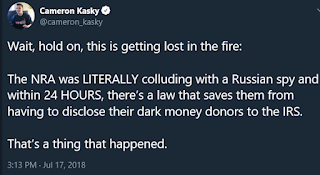 “Trump’s Treasury Department made it easier for anonymous foreign donors to funnel dark money into nonprofits the same day a Russian national linked to the NRA was arrested for attempting to influence our elections,” he said. Labor unions, volunteer fire departments, issue advocacy groups, local chambers of commerce, veterans groups, community service clubs, and other so-called social welfare 501(c)(4) groups or those that don’t generally get tax-deductible contributions will be freed of requirements that they list the names or addresses of their donors on their annual returns with the IRS. Treasury Secretary Steven Mnuchin said in a statement announcing the decision that Americans “shouldn’t be required to send the IRS information that it doesn’t need to effectively enforce our tax laws,” adding that the IRS “simply does not need tax returns with donor names and addresses” to do its job. May the Space Force be with Us. The Face of a MAGA Trump Worshiper!!! AG Schimel is against Prison Reform? Yes. What the Trump Administration is thinking...?